FunWithWind introduces a 16ft and 32ft Panda. Our new Panda Bear has become a big hit on many flying fields. The 16ft bear is the ideal entry into large kite displays, easy to fly and is easy to manage and setup a tie down system. Both sizes include drogue to maintain stability. Please check our website for tie down systems for large kite flying. It is always recommended before you enter the large kite arena that you go flying with a veteran and pick up all the safety tricks and tie down systems. The Panda is quality construction with an excellent bridle system that will provide many years of enjoyment . Includes a large pull string storage bag with straps for easy carrying. You will find many of our large kites are manufactured direct from our contracted plant in China based on our specifications. 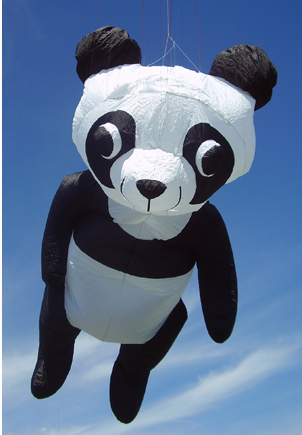 You can find large Panda kites online for twice the price or you can save with FunWithWind.